Seems Sony has held on to their word. Sony Mobile has post the Xperia Z1 as available to buy from them and the main three carriers. As of right now, the Rogers link does not work, but the Bell and Telus link do. Sony's own link to it's website does not show the Z1 available to buy online yet (but does post the Z Ultra up for pre-order), but does direct you to find a store to buy from. So far, only Bell has a price listed and it comes in at $199.99 on 2 year contract and a no-term price of $699.99. The image above seems to outline the colour availability for each carrier. Bell has both the black and white while Rogers scooped up the Black and has the exclusive on the Purple. Telus seems to be caught out in the cold with only the black colour available. The Sony link suggests all colours will be available from them, but nothing has been confirmed yet. Stayed tuned for more updates. Update: Talked with Sony Store and they confirmed that the Xperia Z1 will come with all colour options. It is expected to go on sale on October 18th and will be priced at $699.99 unlocked. Hope your wallets can handle it! 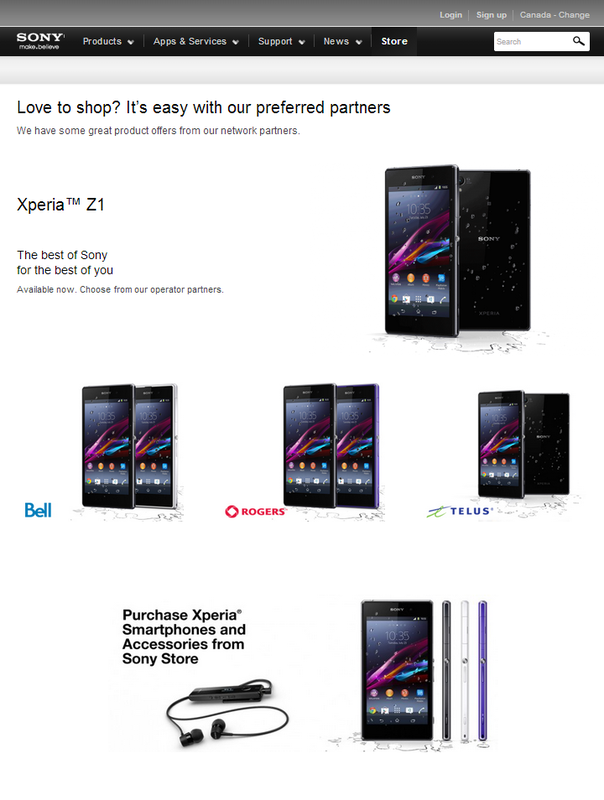 Update 2: Not sure why I didn't catch this before, but it looks like Telus has the pricing on the general catalog (but not on the Z1 page). They have a 2 year contract price of $199 and an out of contract price of $725. A little on the expensive side. 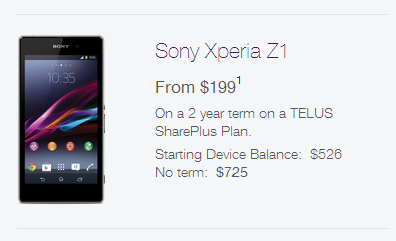 Update 3: And now the Z1 is live on Telus's site with the above pricing. Also, they only list black as available. Still holding out for Rogers to go live. Update 4: And last, but not least, Roger's has now listed the Xperia Z1 in black and purple on their site. The 2 year price comes in at $199.99 and out of contract price comes out to $599.99.